Only open if a show is booked... check below! Blues lovers and blues players have made the new Jamey's their home away from home for over a year now, and know that this is the best place to come for some really good and inexpensive eats, fresh ground coffee and espresso, great music, and friendly people. The vibe is home-like and cool, and the sound is out of this world. Jamey's provides a full professional grade backline, so players only need to bring their instrument to jump up on stage and jam. 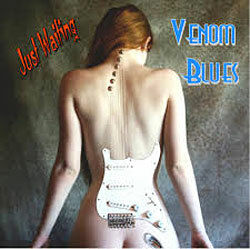 The open mic jam runs from noon to 2:00 pm, and the smoking hot Philly Blues Kings lays down a set from 2:00 to 3 pm. The Philly Blues Society hosts the monthly meet-up where members new and old can come to play, eat, chat and enjoy a day soaked in the blues. Many guests also like to host gatherings or parties during the brunch, as there are tables and chairs for dining, and comfortable seats to listen to the music - and it does not cost them a thing to meet up there! Plus, it is wheelchair accessible, is BYOB, and has plenty of free local parking. Being right in the center of downtown Lansdowne, next to the train station, there is abundant public transportation as well. Check out the mouth watering brunch menu on our menu page. No reservations are needed. Just load up some friends and head on down! “Preston Reed invented integrated percussive guitar playing in the late 1980's, revolutionising the way the acoustic guitar is played and inspiring generations of musicians around the world ever since." “Reflections was in the Top 25 on the Folk DJ Chart for 3 months, reaching a high of #9 and has been on the charts for 4 months." 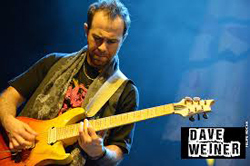 "Lead by frontman, Dave Weiner, longtime guitar player for the Steve Vai Band. 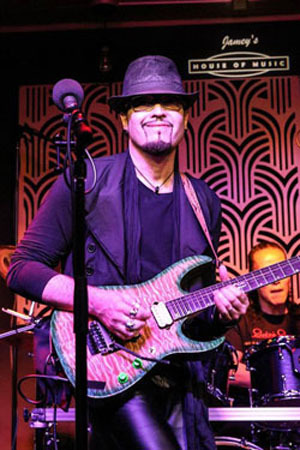 A must-see"
Join us for a rare event - the nascent stirrings of a new blues band led by uber-guitarist Dave Weiner of the Steve Vai Band, and a crew of seasoned blues singers and players. We don't know what to expect - but it's bound to be awesome! "...it is Lizzie’s “rocker- Janis Joplin” vibe that makes her a phenomenal front-woman born to perform. Strong and carefree is what we all want to be, and Lizzie And The Makers embody that dream through their music." With influences ranging from Paul Butterfield and Ann Peebles to Lynyrd Skynyrd and Pink Floyd, Lizzie has been a guest at many NYC all-star jams, sharing the stage with the likes of James Carter and Sweet Georgia Brown, and has brought the house down as a vocalist for NYC’s most sought-after tribute collective, Murderers’ Row. At age 4, Lizzie began studying Classical Piano and Music Theory at what was then known as Mannes College of Music and was an avid student there for 14 years. She also has studied under renowned vocal teacher, Don Lawrence, for upwards of 8 years. Lizzie's Dad was a constant on the 60’s rock scene, acting as sideman for Chuck Berry and touring with Martha and The Vandellas and the Dave Clark Five. Her grandmother a classical harpsichordist and her grandfather an opera singer, a love and ability for all music truly courses through her veins. With Lizzie and the Makers, she has rocked up and down the East Coast, taken the West Coast by storm, and found a new musical family in Texas, after blowing the roof of her SXSW showcases in Austin. 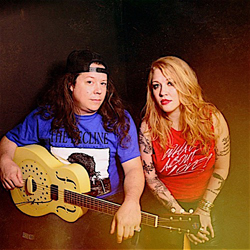 Dark and soulful lead vocals and lyrics by Lizzie Edwards and innovative arrangements by Greg McMullen combine the blues, rock and psychedelic soul of musicians like Freddie King, Sharon Jones and Led Zeppelin. Greg describes his music style as "sonic deconstruction on electric/acoustic/resophonic/lap/pedal steel/bass guitars, and other devices..." Trying to bridge the gap between Arto Lindsay and Joe Walsh, Greg has played with Chris Whitley, Reeves Gabrels (David Bowie/The Cure), Meshell Ndegeocello, Trixie Whitley, Twilight Singers, Bonsai, Bentmen, Matt White, Speedbuggy USA, and the Glenn Branca Ensemble. He is supported by Ernie Ball/Music Man, Mesa/Boogie, Voodoo Labs, and Electro-Harmonix. Greg co-writes the majority of the Makers’ songs with Lizzie and they are already 8 songs into their second full-length album, due out in 2019. Rob Clores is an American, New York-based keyboard player, who has toured and recorded with The Black Crowes, Tom Jones, Enrique Iglesias, Men at Work frontman Colin Hay, Marius Muller Westernhagen, Joan Osborne, Blues Traveler frontman John Popper, Spin Doctorsfrontman Chris Barron, Southside Johnny & The Asbury Jukes, Jesse Malin, Willie Nile, The Dirty Pearls and James Maddock. Saxophonist/Clarinetist Jeff Hudgins is a founding member of Brooklyn group Bombay Rickey, and a transplanted Texan sax player whose music has been described as "somewhat menacing” (New York Music Daily). Aside from Bombay Rickey, Lizzie & The Makers and Rembert & The Basic Goodness, his performance agenda has included premieres by John Zorn, Tim Berne and John Harbison, and he regularly writes music for the NYC groups Anti-Social Music and Opera On Tap. "Philadelphia's best loved blues band"
Philadelphia’s Dukes of Destiny have been making music for over 34 years, producing their own style of rocking blues and old school R’n'B. 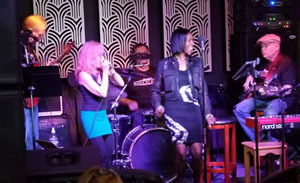 With a lineup of songs that include their unique arrangements of blues and soul standards as well as heartfelt originals, the Dukes get audiences moving and grooving and having a great time. The Dukes have released four CDs, been a fixture at area clubs, and have played in many festivals and concert series including the Philadelphia Folk Festival, Chestnut Hill’s Garden and Fall for the Arts Festivals, The Media Blues Stroll, and the Phoenixville and Paoli Blues Fests. A high-energy six piece band with 5 outstanding instrumentalists and 5 soulful singers, the Dukes never fail to put on an exciting show that get people darning, singing along and having an absolute party. They continue their reign as “Philadelphia’s longest lived and best loved blues and soul band.” Come on out and experience the fun. 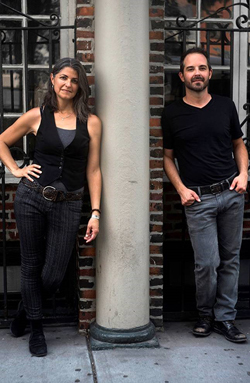 "Authentic acoustic blues at its finest"
"If super-groups come as duos, this one is it"
Kindred spirits and longtime friends CAROLANN SOLEBELLO and JOE IADANZA are perhaps the yin and yang of performing songwriters. Solebello’s smooth, warm voice and precise rhythm guitar perfectly dovetail Iadanza’s raw, honest vocals and graceful six-string virtuosity. Smart songwriting chops and emotional eloquence possessed by both blur the lines between tough and tender, masculine and feminine, Americana and folk. Born of Italian immigrants and union activists, JOE IADANZA understands the passionate struggle of the American dream. Recalling Springsteen, Leonard Cohen, and Cat Stevens, this Long Island native’s music is rooted in classic folk: honest and raw. Iadanza has been heralded for his deeply personal songwriting, and fluid, percussive guitar playing. He continues to work with artists as a producer and songwriting coach, including with Americana artist, Carolann Solebello on her newest release, Shiver; and on Spuyten Duyvil’s The Social Music Hour, Vol. 1, which was nominated by the folk community for an Album of the Year award. Look for a string of new original singles, Including the just-released “Thunder Road” and “Wrecking Ball.” Joe will be on the road with solo and co-bill shows beginning this fall. Biodun Kuti is Paul Simon's guitarist, and is known as the "Jimi Hendrix of Nigeria"
Biodun Kuti grabbed the guitar at the early age of fifteen and started playing in churches, with his father’s band, and other local bands in Lagos, Nigeria. Descended from an ancestral lineage of Yoruba musicians, Biodun’s childhood was bound with Juju, Highlife and traditional drumming. “I grew up in a house in Lagos where you could find guitars in every corner of the house, and all of my brothers are musicians as well,” says Biodun. “My grandfather was the chief of the village of Ifewara – right next to Ife (in the state of Osun) which is believed to be the cradle of the Yoruba people. His house was filled with a hundred different traditional Yoruba percussions. So it was that I was brought up in both traditional and modern Yoruba music, finding a fluid style of guitar playing inflected with jazz and funk elements.” Biodun, brother Kayode, and Ik have played together for years. Along with American guitarist Jon Dichter, the New Nigerian Gypsies produce a unique and original sound with very deep West African roots. Biodun continues touring with Paul Simon, and will be with him this August in Japan. "Man, I just love your playing. 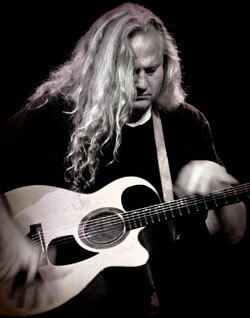 You scare me"
Internationally and nationally acclaimed Toby Walker has been hailed as an award winning, roots music fingerstyle guitar virtuoso and songwriter who has toured the US, the United Kingdom, and Europe. 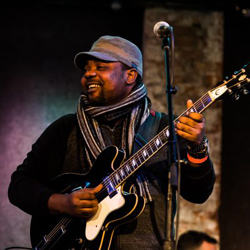 Blending the styles of blues, ragtime, country, bluegrass, old-time jazz and rock, Walker has his own style and as such received numerous awards, including being the 1st place recipient of the International Blues Challenge Award in Memphis and the NY Music Award for best instrumental CD. Walker has also been inducted into the NY Blues Hall Of Fame. 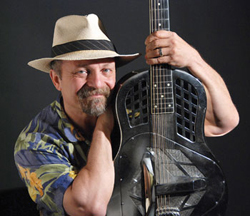 Walker is a nationally recognized guitar instructor, having taught at Jorma Kaukonen's Fur Peace Ranch, Woody Mann's Guitar Seminars, The Swanannoa Gathering, and the National Guitar Workshop. Walker also has eight instructional DVD's on Happy Traum's Homespun Music Instruction, and has produced hundreds of instructional videos on his own. At long last the voice behind Dan Hicks And His Hot Licks, The Kinks and Asleep At The Wheel is taking center stage. Jazz vocalist Maryann Price leads her own jazz trio and is one half of the eclectic duo Ethyl’n Methyl, along with Asleep At The Wheel alumnus Chris O'Connell. After singing commercial jingles in her native Baltimore and jazz in Las Vegas showrooms Price moved to San Francisco in 1969. She was immediately hired by the most original band in town, Dan Hicks & His Hot Licks, becoming one of the most popular groups on the west coast. Upon hearing of the Hot Lick's breakup in 1973, the Kinks' Ray Davies asked Maryann to move to England and join the legendary British rockers. Davies penned several songs for Maryann and she stayed with the Kinks for a year, touring extensively and recording "Preservation Act 2". 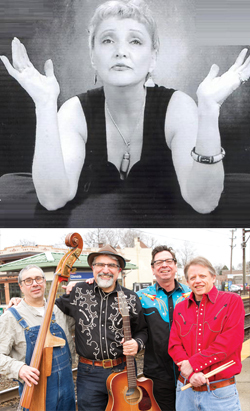 Returning to America, Maryann formed The Girtones with former Hot Licks guitarist John Girton and in 1980 Price was contacted by longtime fan Ray Benson, leader of the legendary band "Asleep At The Wheel" and soon she was logging countless road miles. She stayed with the "Wheel" for two years and recorded "Framed" with them before embarking on her solo career. In 1991 Maryann organized the first reunion in 17 years of the original Hot Licks. The show packed Austin's Paramount Theater and culminated in an appearance on "Austin City Limits" which generated unprecedented viewer response. Maryann’s voice can be heard on numerous commercial jingles and along with Chris O'Connell she appeared on the Southwest Airlines television commercials. Maryann now resides in Austin, Texas where she performs regularly and her recordings are much sought after. Price's long awaited first solo album entitled "Etched In Swing" received critical acclaim as did her live, autographed CD "Hot 'n' Cole". Jazzland, released in 1998 features many of Maryann's favorite musicians and songwriters. 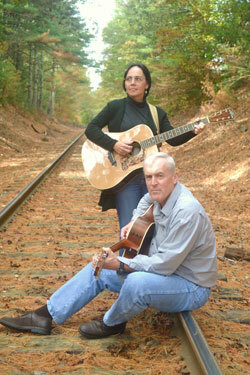 "Milagros" is Texas Roots Music at its best, featuring Maryann and late husband Tary Owens. "Lone Star State O' Grace" was released in 2003 and in 2004 Maryann teamed up with fellow "Lickette" Naomi Ruth Eisenberg for a live album at the bay area club Freight & Salvage, but whether it's boogie, ballad, or jazz, the unifying element is the one-of-a-kind voice of Maryann Price. The Edge Hill Rounders have a distinctive sound. Tim and Paul draw inspiration for their vocal harmonies from brothers like Ira and Charlie Louvin and from legendary pairings like Gram Parsons and Chris Hillman of the Flying Burrito Brothers. This is layered over bass, percussion and guitar with a healthy dose of mandolin picking. At an Edge Hill Rounders performance you will hear some of your favorite songs and some that you don't know but wish you had discovered a long time ago. "Balducci’s music is drenched in layers of sonic colors, each representing a tangible emotion, desire, depth, feeling, thought and mood. Rob said "There's this cliche that instrumental guitar music has gotten to be too much of a vehicle for soloing and showing off technique. That's completely the opposite of what I'm trying to do. My music is really like vocal songs with the guitar as the vocals."" Back by popular demand! Rob will return with Kenji Tajima on drums and Andrew Kolba on bass. Raina Sokolov-Gonzalez is a Brooklyn based R&B, jazz and unique fusion artist, and a strong, soulful female singer/composer. "BY FAR the best live music venue on the East Coast"
"Jamey Reilly couldn't possibly have created a finer oasis for musicians to perform. It's really a gem. SERIOUSLY! Everybody try and get a date there!!! (Just leave some room for us because we're definitely going back!!!)" 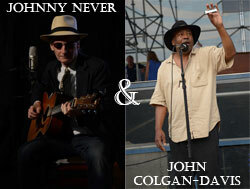 "Last night we debuted at Jamey Reilly’s Jamey’s House of Music. Jamey has outdone himself. He has an incredible backline, and the sound, which he engineers is exquisite. 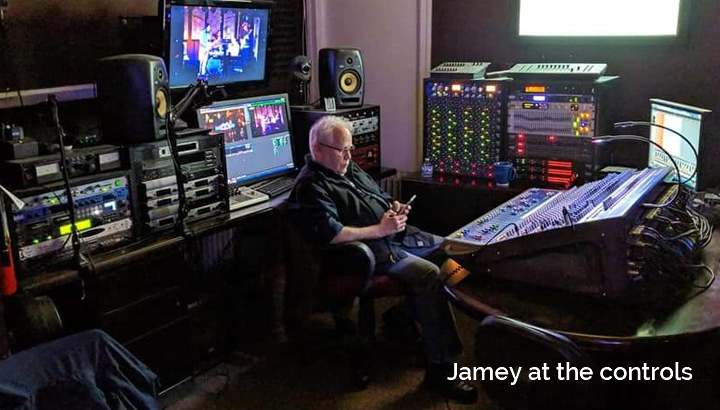 Working with Jamey helps make performing seamless. He knows what he is doing and is an excellent communicator. He is also a musician, which helps a great deal (the man has ears). The food at this venue is incredible. The flavor-I can’t begin to find the words to express how excellent it is. If you have not been to Jamey’s House of Music, get down there, catch a show. Get there early and enjoy the amazing cuisine. It will blow your mind." "This small room is by far the best sounding music venue I've ever experienced. It's a truly exceptional labor of love..."
"THE place to Jam!!! Jamey is the man, the myth, the legend. Great equipment & exceptional drum set." "We've played every kind of venue imaginable on several world tours, and I have to tell you that this is probably the best venue we have ever played. It's simply brilliant. Thank you for everything done to perfection." "I tell everyone about Jamey and Jamey's House of Music. Everyone in Nashville knows about this place. I play some of the best rooms in the world, like the Bluebird, Douglas Corner, Third and Lindsley, places with great sound systems, and nothing beats the sound in this room. ...This is my favorite place to play in the whole world." "The sound is absolutely perfect. I could hear every note of every instrument. Just incredible." I'm a "venue snob" and this place is AWESOME ! Cozy, intimate, acoustically A+, comfy seating, bathroom is spotless, people are warm & friendly ... can't wait to return ! "... a dream performance space. Perfect acoustics, top quality production values, a visually lovely setting, and an overall aesthetic ambience that, like a tea ceremony, lifts every gesture to it's highest level. It's perfection, both for the audience and the performers." "Totally going again soon! A++++++!!!" "I can't even explain how delicious everything was." 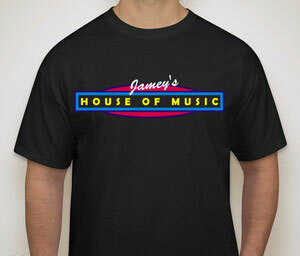 Jamey's House of Music Tee Shirts Are Now Available! in sizes S to XXL. Only $20!